Courchevel (formerly Courchevel 1850) is the most glamorous of the Courchevel villages, drawing in a wealthy crowd of French and Russians. Home to two six-star “palace” hotels and five restaurants all boasting two Michelin stars, this is not the resort to aim for if you are travelling on a strict budget. Designer shops and jewellers line the streets, luring in the VIPs and celebrities before they retreat to their luxury chalets. However, there are some fantastic, affordable chalets in the village too, meaning that you can be first in line at the lift station in the morning. Courchevel is also very well connected to the rest of the 3 Valleys via 2 large Gondolas to the top of the Saulire. If you have the energy and can get up early then the 10 resorts in one day challenge might be for you. In the St Bon Valley you have to check in at Courchevel Le Praz, Courchevel Moriond, and La Tania before going over to the Les Allues Valley to check in at Méribel and Meribel Mottaret, and then you have to tackle the chalet host’s favourite and very fast Jerusalem Red piste down to St Martin de Belleville before heading up the valley to Les Menuires and Val Thorens to complete the Belleville Valley. It can be done quite easily if you don’t get side-tracked but just make sure you catch that last lift back up to the top of the Saulire from the Méribel Valley. 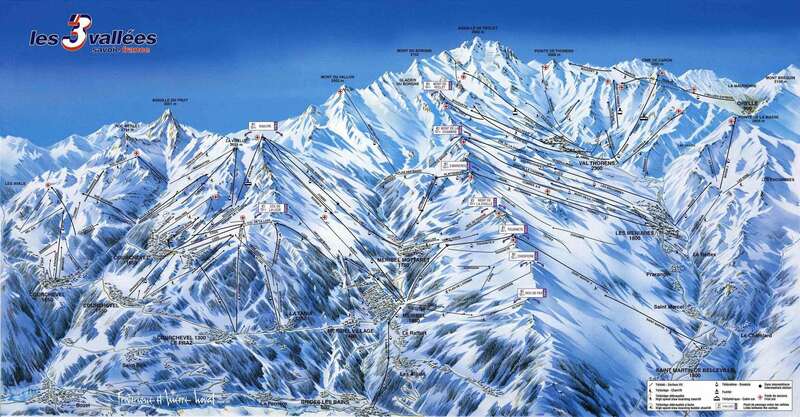 Courchevel (1850) is where the main lift hub is found, giving easy access to the main Courchevel ski area. The slopes directly above the village are a mix of easy greens and some blues; Beginners should head to the nursery slopes at Altiport or take the Jardin Alpin gondola up to the Evolution Zone, although it is worth bearing in mind that the green runs back to resort are busy later in the day as more experienced skiers return from higher on the mountain. 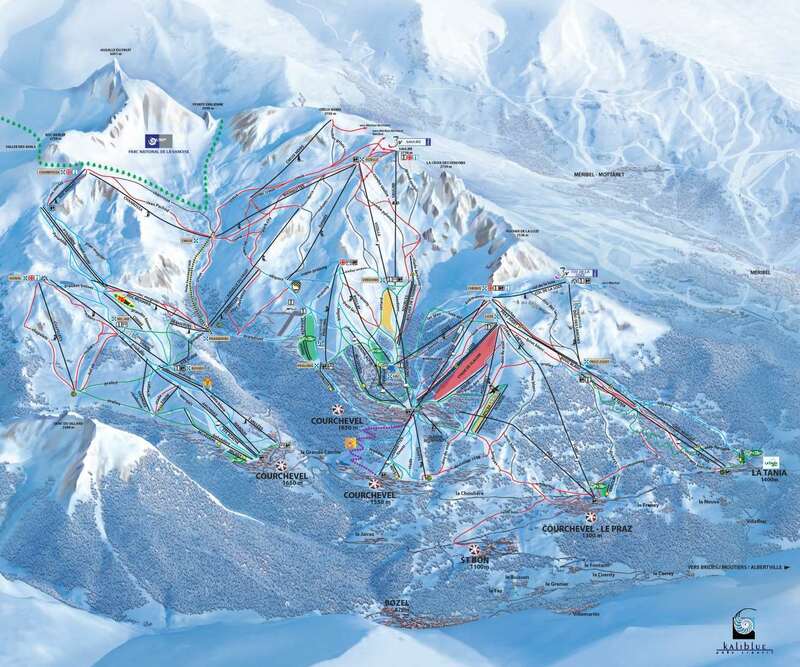 Intermediates should head to the long reds accessed via the Creux Noirs and Marmottes chairlifts; Experts will find some steep slopes and couloirs such as the Grand Couloir sweeping down from Saulire. If the snow is good, head for the blacks over on the Col de la Loze which will take you all the way down to Courchevel Le Praz, weaving through the trees on the lower slopes. There are some excellent off-piste opportunities too, hire a guide to seek out the untracked areas. With over 470 snow cannons and 22 piste bashers in Courchevel ski area, the pistes are always immaculately groomed and snow is perhaps more reliable than the rest of the 3 Valleys as most of the slopes are North facing. Après ski is busy without being rowdy in Courchevel. There are lots of bars on the main street and around the Croisette to try but our favourite is the Mangeoire Piano Bar. After dinner the 2 clubs that attract the crowds are Kudetas (Le Kalico) and Le Caves de Courchevel. If you are walking past any of the glamorous Hotels it’s well worth the time to pop in and check out their bars that are worked by really knowledgeable staff and offer top quality cocktails and wines in beautiful lounges among the beautiful people of the fabulous Courchevel. The nearest international airports to Courchevel are Geneva or Lyon both within a few hours drive of the resort. I can't fault it even though the snow wasn't ideal. The hotel was really central next to the Forum. The staff couldn't have been better - they were polite, helpful and nothing was too much trouble for them. The food was really excellent and having the teas, coffee and chocolate available all day was fantastic. I went on my own and I didn't eat one meal alone. There was a social table which was great, but had I wanted to eat alone, it wasn't a problem. I would go there again. I know the skiing conditions were fantastic last week so I am bound to have enjoyed the holiday, but I have to say that Chalet Dahu and the staff were absolutely excellent. Yes, the hotel is not the Ritz but it was a great base to sleep, eat well and slope off onto the slopes. Such a reasonable price too. It was particularly good to be able to make teas, herbal teas, coffees whenever we liked in the hotel. Many other French hotels do not have this facility and one ends up having to buy yet another kettle to use in the room! Thank you to everyone involved!